XIX, 174 p., 1 ill., 14,8 x 20,5 cm. 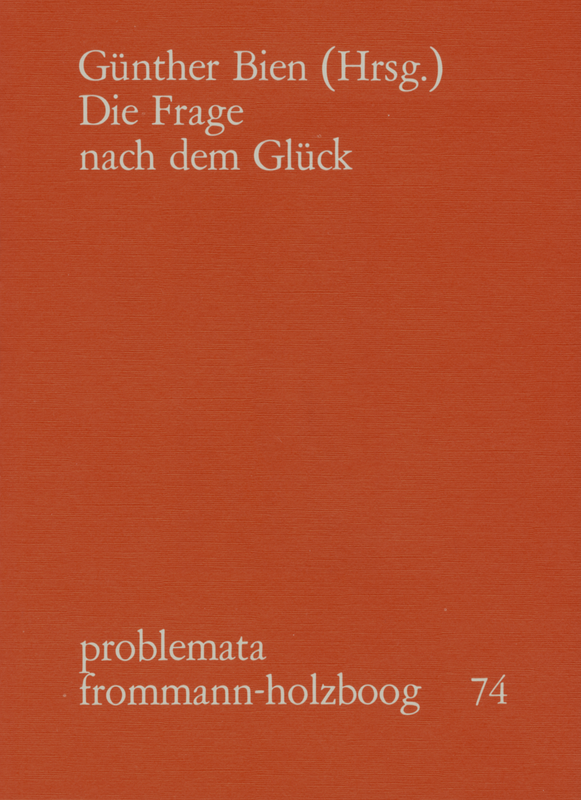 With contributions by Pierre Aubenque, Günther Bien, Otfried Höffe, Wolfgang Kluxen, Hans Krämer, Odo Marquard, Rudolf Schottlaender, Josef Simon, Manfred Sommer, Robert Spaemann and Elfriede Walesca Tielsch. As a teaching of wisdom, philosophy has been for centuries what the philosophical layman still expects it to be today: a doctrine of and an advice on a good, successful, and happy life. Yet, since the beginning of the nineteenth century, the problem of happiness has vanished from the centre of philosophical interest. Today it returns under different headings (for example, quality of life, mental health, psychological well-being, preservation of endangered identity) in different branches of knowledge and different connections. The general view of the earlier practical wisdom, the pursuit of a fulfilled existence being an essential feature of humanity, is established by this. In an interpreting and systematic manner, the essays of the volume announced here examine the questions of how happiness, fulfillment of life, and self-realization have been regarded, of how they must be understood today, and of how they relate to the experience of misfortune and grief. With that the volume’s contributions reclaim - in the discussion with more recent insights - one of its classical topics for philosophy. Rudolf Schottlaender: Umweg über die Tragödie oder: Philosophie als Pathosophie.